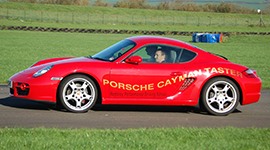 Drive the Honda Civic TypecR and Porsche Cayman sports cars at Pembrey circuit. 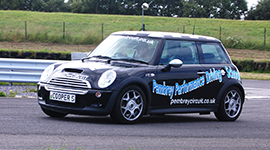 Guests will also get to drive the MINI COOPER S performance saloon car as part of this experience. At your scheduled time you will be called to the briefing room, where you will receive a driver’s safety briefing. On the completion of the drivers briefing, you will be introduced to your Instructor who will take you for a 4 lap familiarisation session highlighting many of the Circuit driving techniques and overtaking manoeuvres. Upon your return to the paddock your instructor will then install you into a Honda Civic Type R . You will then set off down to the pit lane to join the circuit for a further 6 laps, but this time in a 200 bhp Civic. 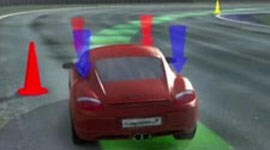 Upon your return to the paddock your instructor will then install you into a Porsche Cayman . You will then set off down to the pit lane to join the circuit for a further 4 laps, but this time in a 325 bhp Sports Car! Your instructor will be taking notes on your performance during this session on a driver assessment sheet that you receive at the end of your course. When you take the chequered flag which indicates your session has concluded, you slow down and return to the paddock. Then pick up your driver assessment and certificate. CONTACT CIRCUIT OFFICE FOR BOOKING DETAILS - DEPENDING ON TIME OF PURCHASE ALL OUR VOUCHERS ARE VALID FOR 9 MONTHS BUT WILL EXPIRE ON OR BEFORE THE 31st OCTOBER OF EACH YEAR.